The Catholic Church, by its name and by its practice, is universal. In Chicago, Catholics of Polish descent often worship together in the same Parish. In Memphis, most Latinos worship together at Church of the Resurrection on Newberry Drive, in East Memphis. In Florida, many recent Haitian immigrants or second and third generation Haitian-American descendents attend church in the same parish. In California many Korean Catholics worship together. Is it segregation of Catholics? Not at all! It's a fact that people simply worship where they live, feel most comfortable in terms of cultural similarities, or have the most friends and/or family. 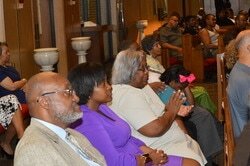 In fact, while St. Augustine, in South Memphis, predominantly serves African American heritage, people of different ancestries and cultures attend, with many driving 20 minutes or more from East Memphis and Collerville. You might say, St. Augustine has a "southern culture," also.